Last weekend I went to the coastal town of Margate. There are two sides of Margate. There is a side that contains typical high street shops such as New Look, Primark, Greggs, Superdrug etc. (this side isn't the best) and then there is the cute, vintage backstreets of Margate. Down these backstreets there are lot's of vintage, retro and all round cute shops. Along with these charming little shops there are also petite galleries and also a rather great gallery called the Tate Modern. 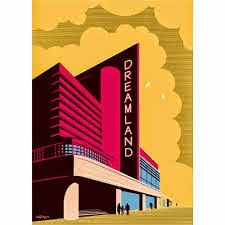 Something to look forward to is also the reopening of Margate's Dreamland. The famous seaside attraction park is the vision and it is said to become a place with guaranteed great fun! Ensure to visit this lovely Kent coastal town with great vintage shopping, dainty cafes and a long sandy stretch. Why not take a trip this weekend? This weekend Margate is putting on a 'What a Vinatge Carry On' event (16th & 17th August 2014). There is said to be markets, music and nostalgic goings on! Margate has changed in the last 5 years or so. I would also recommend Herne Bay, a few miles down the road. There is an easy going feel to the resort and although not sandy its coastal path towards Reculver is as bracing a walk as you could wish for. Yes, I agree! My family has a caravan in Whitstable, a lovely little coastal not far from Margate. The kent coast is such a beautiful place!